What's a Maryland girl serve at her summer holiday parties and cookouts? If you're from my neck of the woods you already know! My family and friends will arrive and my table will be set just as you see in the photo. My menu will include Maryland Steamed Crabs and sweet corn on the cob. Some coleslaw and potato salad and maybe some hot crab dip and steamed shrimp on the side. There's always newspaper for the tablecloth of course and lots of paper towels and mallets and melted butter. 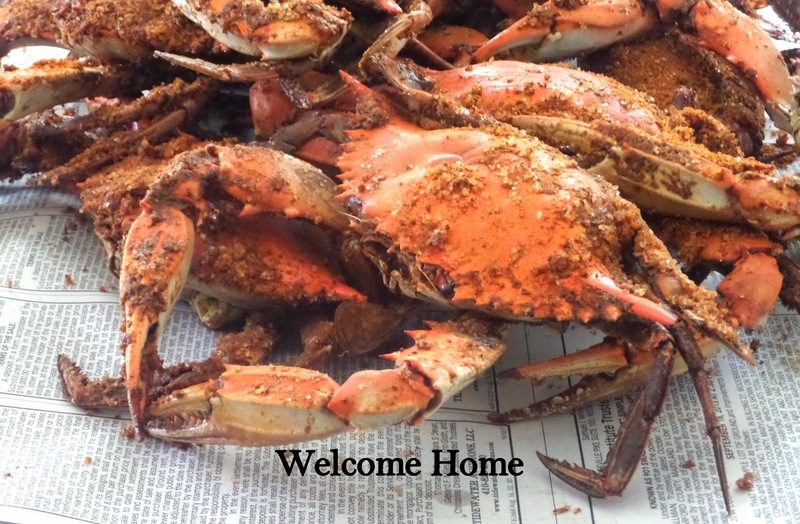 A meal like no other and a true Maryland tradition! Sweet and succulent tender crabs steamed in Old Bay Seasoning and Beer. Sweet corn Basted in melted butter and sprinkled with more Old Bay! Oh My! Combine 1/2 cup seafood seasoning, salt, beer, and vinegar in a large stockpot over high heat. If you have a steamer with a basket that's even better. Bring to a strong simmer. Fit a screen over the beer mixture and layer the crabs on the screen. Be sure that the crabs are above the simmering liquid. Cover.Steam crabs until they turn bright orange and all of the blue/green color is gone, 20 to 30 minutes. Sprinkle with the remaining 1/4 cup seafood seasoning before serving. Photography is copyrighted and the Property of Welcome Home. Always fun to meet a fellow Maryland food blogger. Glad I found you today, I've pinned so many of your recipes to try!